SMC Network's EZ SwitchTM SMCGS26C-Smart is a new 26-port Gigabit Ethernet Smart Switch providing 24 Gigabit ports and 2 100/1000BASE-X SFP slots. The switch supports a flexible web-based management interface as well as SNMP for both IPv4 and IPv6. The new SMCGS18C-Smart provides a range of feature-rich functions, including VLANs, Spanning Tree, link aggregation, multicasting, security, storm control, and QoS with 8 priority queues. 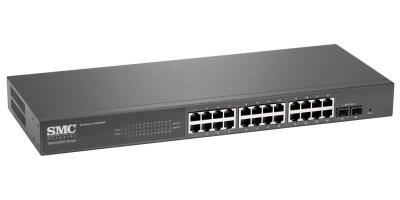 Ideal for users looking to migrate from unmanaged to managed networks, this Smart Switch is easy to install and perfect for SMB and SOHO businesses.